Many people believe the 1969 fire on the Cuyahoga River in Cleveland helped bring attention to the issue of water pollution. While the burning river made Cleveland the "Mistake on the Lake," it also helped get the Clean Water Act passed by Congress, and led to a large-scale clean-up of the Cuyahoga and many of the nation's waterways. At the Southerly Wastewater Treatment Center, 15 minutes south of Cleveland, 200,000 gallons of water pound over a low, wide cement waterfall discharging into the Cuyahoga River today. “That’s a lot of water. But this has received full treatment,” says Frank Greenland, director of watershed programs with the Northeast Ohio Regional Sewer District. This waterfall, at the end of the treatment process, runs clean. But it looks a lot different when it first enters the plant from the sewer. Stinky sewage comes into the plant high overhead on a conveyer belt and is squished through filters. Toilet paper, leaves and other unmentionables drop out. "This is our bread and butter," Greenland says, laughing. He says the waste comes from toilets all over the region, as well as run-off from the streets. “We have a large combined sewer area. So whatever washes off the streets, can—and will—get into combined sewers," he says. The water then goes through a series of waste settling tanks, and it’s aerated and further filtered until it’s clean enough to head over that waterfall back into the river. But when it rains the sewers can get too full and overflow, instead of heading to a treatment plant. Raw sewage dumps directly into the river. Greenland says when the sewer district was formed in the early 1970s, about nine billion gallons of raw, untreated sewage were being dumped in the Cuyahoga River and Lake Erie each year. But with the federal monies that flowed in in the wake of the Clean Water Act, as well as increases in fees to rate payers, there have been massive upgrades to sewer pipes and treatment plants like this. 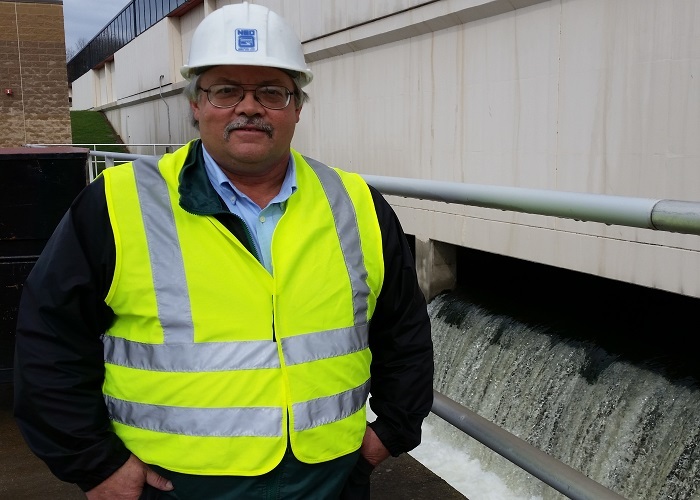 He says they’ve cut sewage overflows in half to four and a half billion gallons annually. That’s still a lot of raw sewage. But the reductions have made a big difference. It’s an overcast weekday morning, and in the midst of old industrial buildings, in Cleveland’s downtown flats, just a mile from where the Cuyahoga meets Lake Erie, people are watching birds. A large freighter slowly navigates a curve in the river, while Chris and Chad Saladin stand along a new hike and bike path watching a pair of peregrine falcons that have nested under a bridge. Nearby, workers are getting ready for the day at a new restaurant owned by Metroparks Cleveland. From the large wooden deck, a team is rowing past on long thin boats. In the 1960s, the Flats used to be sooty and industrial; the water was an oozing, black muck. People didn’t want to live here. According to some stories, hotels were built with no windows facing the river or lake. Jane Goodman graduated high school in the Cleveland area in 1969, the year the Cuyahoga River burned. She got turned onto the environmental movement on the original Earth Day in 1970. “In those days we were all about fixing the world, fixing the planet,” she says. Today, she leads a non-profit called Cuyahoga River Restoration. It’s her job to get the Cuyahoga taken off a list of polluted places. Half of the Cuyahoga River, the part that flows from Akron north through Cleveland to Lake Erie, is designated an “area of concern” by the U.S. and Canada. One reason: the lack of healthy aquatic life. And she says they’re not laden with pollution. “You can eat the fish in the Cuyahoga River,” Goodman says. Some historians credit the environmental bounce back to loss of industry in Cleveland and other cities. Steel mills and other factories closed down. And what may have been bad for the economy and jobs was good for fish and birds. Environmentalists in this region, however, credit the Clean Water Act and the regulations and money it brought in. But they say there’s still more to do. Andrea Irland of the National Park Service is creating a water trail along the entire 100 miles of the Cuyahoga. Even she worries about falling out of her boat into the river. She remembers being in a slight panic about it one time. "As soon as I remembered that A: I knew how to swim, and B: I could touch my feet on the ground, and the water quality was really good that day, because the water was low—I was fine," she says. River advocate Jane Goodman says people should be careful to stay out of the water around sewage pipes after a rain. But otherwise she says it’s okay to get in. “Fall in. Just get out quickly and don’t swallow,” she says. Like many urban areas, northeast Ohio is working with the EPA to reduce sewage overflows. At the same time, many Clevelanders have embraced the jokes about their gritty industrial past—and the historic fire. They even get a lot of play from it—among them, things like Burning River Pale Ale, Burning River Guitars and Burning River Roller Derby.